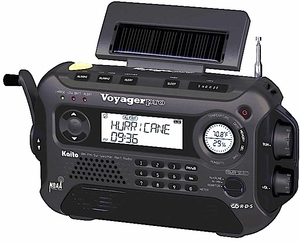 A perfect radio for emergencies and disasters, it comes with all the features that you need in any emergency situation. It comes with a High quality AC type brushless generator. The solar panel powers the radio by itself and charges the built-in batteries as well. To maximize the sunlight�s rays, the solar panel is designed to tilt with the suns position to receive the energy during the day time. On the bottom side of the solar panel is a 5 LED reading lamp that you can use in poorly lit conditions. The radio is built with a multi-function LED flashlight. The super bright LED on the side can be used as a flashlight. 1. Dynamo Cranking Power: 120 turns per minute of cranking will power the built in Ni-MH battery pack with strong current and voltage. 2. Solar Panel Power: Under the direct sunlight, the solar panel will power the radio without a problem. 3. AA Batteries: You can use 3 normal AA batteries to run the radio for maximum reception. 4. A built-in Rechargeable battery pack. 6. Charge from a computer via USB port. 1. 5 LED reading lamp for camping and emergency use. 5. Weather Alert: To be activated by weather alert signals. 9. Sleep Mode up to 90 minutes and infinity.